Reuben Stopy and Maria Mays were the top male and female finishers in Saturday’s Dive BVI 10k Series finale—the final tune up for the 5th annual Virgin Gorda Half Marathon and Six Miles Challenge on May 14. A record 98 persons have already preregistered for the event that caters to 125 participants. 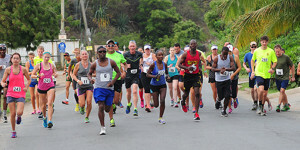 Stoby led the filed that included 18 of the 38 participants from Tortola on the second segment of the course in the Valley, with vistas of historic Copper Mine and the world renowned Baths that included scenic views of the outer islands, St. John and Tortola, in 41 minutes and 53 seconds. Mays, the top woman covered the course in 47:41. “I think my time is pretty decent,” said Stoby who had Guy Williamson breathing down his neck last year when he ran 40:19 and Williamson, 40:59. “But, I’m happy with the time ahead of the Half Marathon. Stoby who ran 46:14 over the first half of the course—including the first six miles up to Nail Bay two weeks ago—said both races were important in his preparations for the May 14 race. With some many races on Tortola and Virgin Gorda to choose from, staying healthy is everyone’s goal. Stoby, however, runs in all of them. “I know when to push and when not to, but, it’s wonderful just to be running and keeping fit all the time,” he pointed out. Final results: Male: Reuben Stoby, 41 minutes and 53 seconds. 2. Julius Farley, 43:28. 3. Curwin Andrews, 48:47. 4. Brian Davis, 50:21. 5. Adrian Dale, 51:32. 6. Zebalon McClean, 52:35. 7. Ishwar Persaud, 52:59. 8. Gabriel Obregon, 55 :05. 9. Marlon Felix, 55:29. 10. Gus Faller, 56:41. 11. Patrick Ormond, 56:47. 12. Mahinda Ratnayake, 58:24. 13. Dennis Versoza, 59:53. 14. Aaron Gardner, 1:00.11. 15. Damien Parry, 1:02.31. 16. Teejay Torres, 1:05.37. 17. Andy Miller, 1:13.55. 18. Dan Starling, 1:17.59. Female: 1. Maria Mays, 47:41. 2. Melissa Brunner, 51:40. 3. Kim Takeuchi, 54:11. 4. Katleen Brownsdon, 55:02. 5. Rosmond Johnson, 55:05. 6. Katie Goodwin, 56:41. 7. Josie Ratnayake, 58:24. 8. Becca Knight, 58:45. 9. Kay Reddy, 1:00.10. 10. Lucy Smith, 1:01.18. 11. Lindsay Fogarty, 1:05:01. 12. Sara Mc 1:06.34. 13. Gretel Honis, 1:13:55. 14. Tara Murphy, 1:14.34. 15. Nedy Ador, 1:14.42. 16. Clair Burke, 1:14.44. 17. Angie Bester, 1:17.59. 19. Chris Yates, 1:29.44. DNF: Emily Drinkwater & Brendan O’Reilly.